Sometimes when I'm creating a new recipe I sit with a pen and paper and really think about what I'm going to do. I write it out a few times, add, delete, change, and then test it. I'll tweak a bit and then write a final recipe. Other days I'll grab a few things I have in the fridge not knowing exactly what I'm going to do, and just wing it. After doing this for years and never remembering exactly how I created a recipe, I now keep a pad of paper and pencil on a nearby counter and write as I go! I used the wing-it method to create this recipe. 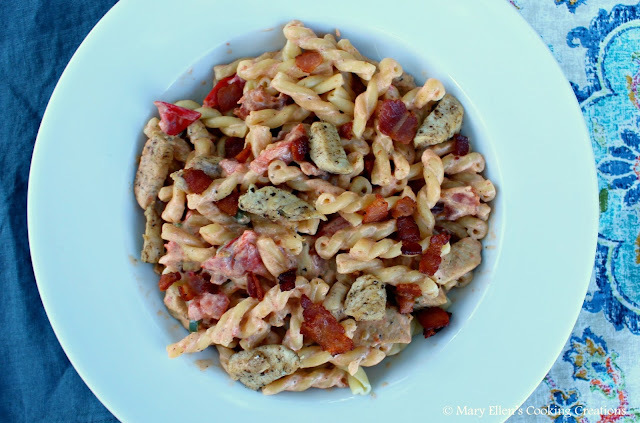 I was craving creamy pasta, had already defrosted chicken, and spotted some bacon that need to be used up. As I was mincing garlic, I saw 2 tomatoes and a jalapeno and decided to throw them in. I love when these recipes turn out so great! I have such a weakness for creamy pasta dishes, but I try not to make them too often. So when I do, I might as well go all out, right? 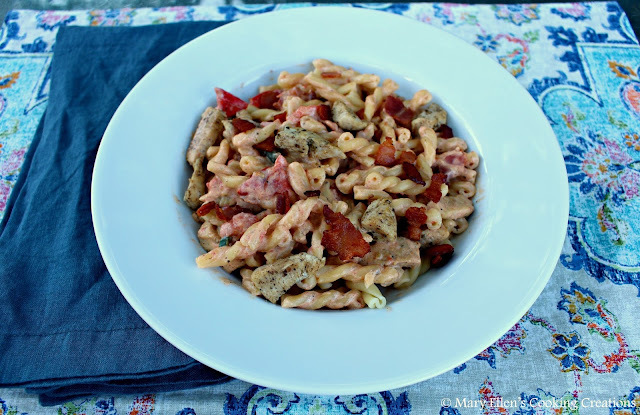 Bacon AND creamy, cheesy pasta? Yes, please. 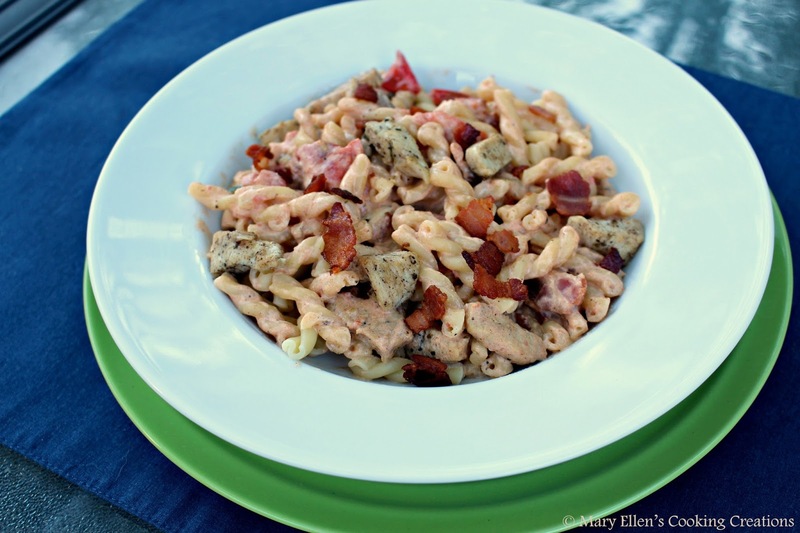 The combination of creamy bacon with crisp, smoky bacon in this dish was so perfect. Make sure you follow the instructions to cook the chicken in some of the bacon grease to really take that bacon flavor through the dish. The jalapenos added just the tiniest bit of heat while the tomatoes were bright and a touch sweet. If you don't want the heat, you could easily keep the color by using peas or chopped spinach instead of jalapenos. 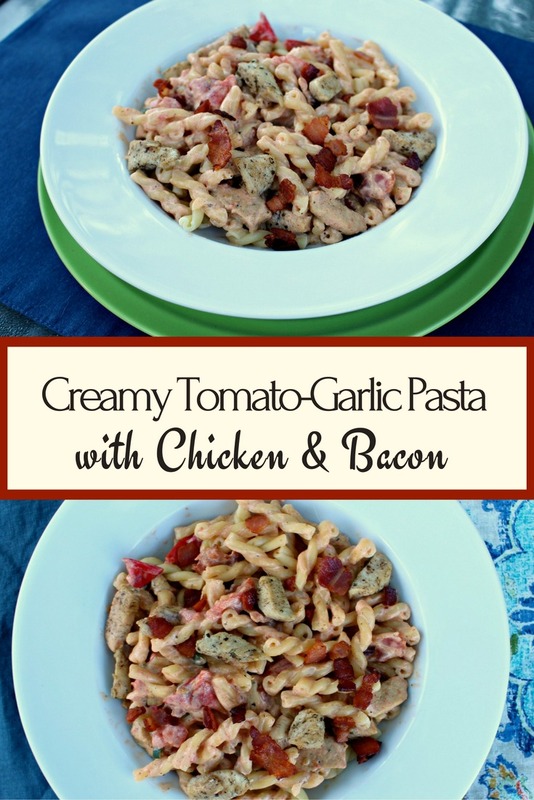 So when you need to satisfy a creamy pasta bacon craving, put this on your menu! It won't disappoint. Heat a large saute pan over medium high heat. Add the bacon and cook until browned and crispy. Transfer to a plate lined with paper towels. Once cooled, crumble. Remove all but 1 Tbsp of the bacon grease from the pan. Season the cubed chicken with salt, pepper and Italian seasoning. Add chicken to the pan and cook for 6-8 minutes, until golden brown and cooked through. Transfer to a dish and keep warm. Add olive oil to the pan and heat. Add the garlic, tomatoes and jalapenos; saute 3 minutes. Very lightly smash some of the tomatoes with the back of your spoon/spatula. Lower the heat and add the cream. Bring to a boil and then reduce to low to maintain a simmer. Remove from the heat and whisk in the cheese. Once combined and creamy, return the pan to the heat over low and add in the chicken, and half of the bacon. Add the pasta slowly, stirring (you don't want to add more pasta than the sauce can handle). Adjust salt and pepper, if necessary, and serve topped with the rest of the bacon.